TOKYO, JAPAN, September 20, 2016 – Toyota Motor Corporation (TMC), Komeda Co., Ltd. (Komeda), and KDDI Corporation (KDDI) will begin an initiative on September 20, 2016 by utilizing a smartphone application called Driving Barista. The application is aimed at reducing the number of traffic accidents in Aichi Prefecture in Japan, which are caused by drivers using their smartphones while driving. This is the first traffic safety initiative in Japan involving a smartphone application, which is to be carried out and jointly promoted by an automobile company, a communication company, and a food and beverage company. For thirteen consecutive years, Aichi Prefecture has had the highest rate of traffic fatalities in Japan. In 2015 alone, there were 44,3691 traffic accidents which resulted in injuries or deaths. Furthermore, there were also 50,1011 arrests involving the use of smartphones while driving, and the increase in violations of this nature has also intensified the problem. This high figure is indicative of the importance to reduce the large number of traffic accidents in the prefecture. In response, ten Nagoya-based media companies2 have come together to work towards the goal of making the prefecture's roads safer under the banner of the "AICHI: No Longer the Worst" project, which began on August 2. Toyota and KDDI are also sponsors of this project. Toyota, Komeda, and KDDI will begin their own joint project in tandem with the Japanese government's 2016 Autumn Traffic Safety Campaign (September 21-30). The companies will promote traffic safety in Aichi Prefecture through an educational initiative where participation is accessible for all, and can lead to a reduction in traffic accidents. The Driving Barista application can only be used within Aichi Prefecture. By utilizing the gyro sensor to sense the tilt of the smartphone body, and the GPS to determine the distance driven, this application measures the distance the driver has driven while leaving the smartphone facedown. 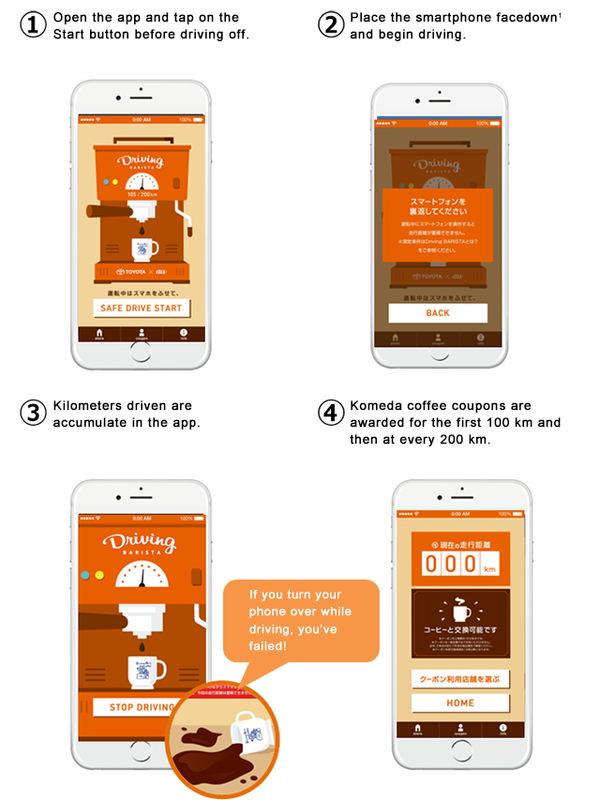 When the cumulative distance reaches 100 km3, the driver can receive a coupon for a cup of blended or iced coffee at a Komeda Coffee Shop4. According to one survey, approximately 60% of respondents said they use their smartphones while driving, with approximately half5 of these respondents keeping only one hand on the steering wheel. Therefore, the companies hope that the new application will raise drivers' awareness about not using smartphones while driving. With regards to the initiative, Managing Officer Shuichi Murakami of Toyota said, "In line with contributing to the ultimate goal of achieving zero traffic fatalities and zero traffic accidents, Toyota has implemented automobile safety measures as one of its top priority management concerns. By carrying out a new traffic safety education initiative together with Komeda and KDDI, we hope to further reduce traffic accidents." Managing Director Masashi Komanba of Komeda said, "As a company that has been supported by the residents of Aichi Prefecture, we hope to help reduce the number of traffic accidents there through our participation as a provider of great coffee." The Director-in-charge of CSR and Environment at KDDI, Akira Dobashi, also stated that, "We have already been carrying out educational activities to prevent the use of smartphones while driving, and we hope that this initiative between the three companies will help solve the problem facing Aichi Prefecture. We developed the Driving Barista smartphone application as a fun way to help prevent traffic accidents. We hope to contribute to accident prevention by providing a new experience for drivers." Toyota, KDDI, and Komeda will continue to take steps toward the realization of a safe and secure society. 4Customers may redeem coffee coupons in stores after 12:00 pm. Coupons may not be redeemable at some store locations. 5Data compiled by KDDI Corporation. Any use of a smartphone, regardless of whether the car is moving or stopped at a traffic signal, etc., was counted as use of a smartphone while driving.